So when a new professional lottery syndicate arrives complete with a fanfare and fancy TV adverts, it’s pretty big news. Cue… Love My Lotto, the new multi-lottery syndicate. I’ll give a more detailed opinion on this one once I’ve had a good look at it from the inside (but here’s a detailed Love My Lotto review ). 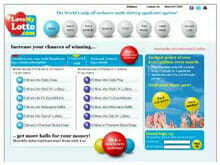 In short Love My Lotto play the UK Lotto, EuroMillions, Millionaires Raffle, Daily Draw and Premium Bonds. And you can join from just £12 a month. I joined already and my syndicate numbers were quickly allocated. So far so good. More on this one soon. In one of your articles you speak about the importance of keeping ones wins anonymous which I also believe is a very good idea. While reading through the Love My Lotto site just now there was an area that displayed latest winners and it had their names and cities that they live in, posted. Do you believe they had a choice about this? Also, is it still true that United States citizens are not allowed to play the Love My Lotto syndicate? Thanks in advance for a reply. They only publish the initial and the town rather than names, so you only see ‘Mr B from Birmingham’ for example, which is pretty anonymous. But there is also an option in the members area to select ‘no publicity’. So I do recommend everyone playing with Love My Lotto select that option. Unfortunately players from the USA are not allowed. But it’s a US law – Love My Lotto would love to open the doors to US players. I wrote about anti online gambling laws a few years ago now. Syndicates were never the target of course, but ended up caught in the crossfire. The law has been challenged, but sadly things have not changed. Hi.. I enjoy reading your articles.. I’m Lebanese living in Beirut (Lebanon’s Capital).. I always check all the syndicate websites you post and write about.. Am I allowed as a Lebanese to play through these syndicates and win..? Thank you for helping me out. Yes you can join too – these syndicates have members from all over the world, and accept players from pretty much everywhere – including Lebanon too of course. As you seem to be in the know about the lotteries, perhaps you can explain what is happening with LovemyLotto. I have had several wins on this site with the two syndicates that I am in, only small ones but over the month winnings total around £40 enough to pay for one of the syndicates for a month. However my winnings basket shows only £2:35 in it and has done since I started. I have emailed them and had no replies, I have phoned them and just get an answerphone, along with no reply to messages I have left. This coupled with no notifications of winnings ( as advertised ) gives me a very bad feeling about LovemyLotto. Do I contact the gambling commision or some other body and report foul play, they themselves are not playing by the rules so why should I be quiet about it, and what worries me is how many others who dont check there numbers are possibly getting the same treatment as I am. I’m not aware of any problems with winnings balances or admin replies, but let’s clarify a couple of things and see if that helps. And if not, I’ll help you try to get to the bottom of it anyway. I know they only man the phones during office hours, but obviously any message left should always receive a reply, as should any email. I’ve not had a problem getting replies when I’ve contact them in the past. But there would certainly have been delays over the recent busy EuroMillions period. Can you tell me the dates you phoned and emailed them? Hi guy joined up with love my lotto on your say so. Haven’t won yet early days. Just wondering what happens to the ten pound wins, do they pay out them or is it just full lines? They pay out all winnings – so the small wins build up in your online wallet until you are ready to withdraw them. Then you just let them know and they send you a payment. Also, is it poss to see your syndicates numbers all 20 of them look forward to hearing from you. Yes it is – just login to your account, then click ‘Your Syndicates’, and then click on the Syndicate number on the left (not the order number) and it shows you all entries, lotto numbers and premium bond numbers, for your group. I notice with this website – looking at the Bronze syndicate – that you get two entries in certain lotteries – EuroMillions for example. Do these entries get placed in 2 separate syndicates or are both entries in the same syndicate? The entries you’re referring to are shared between that syndicate group (of 37 people). So 2 entries in EuroMillions means that group plays 2 combinations in each EuroMillions draw (i.e. every Tuesday and Friday). What can I do if my residence country named Democratic Republic of Congo is not listed among your qualified countries? It is listed – but under just ‘Congo’, so look for the C’s instead of the D’s in their country list.